This was such a great newborn Session with baby Liam. We had photographed his parents (Nina and Greg) engagement session at the Wilson Boat Dock and Daisy Barn Campground. They had an amazing sunset engagement session. Then we photographed their wedding at St. Louis RC Church and reception at Statler City in downtown Buffalo. We did wedding party portraits at Niagara Square, City Hall, and inside of the Statler at the Golden Ballroom. On the maternity session we did a high end fashion shoot around Albright Knox Art Gallery and Delaware Park. 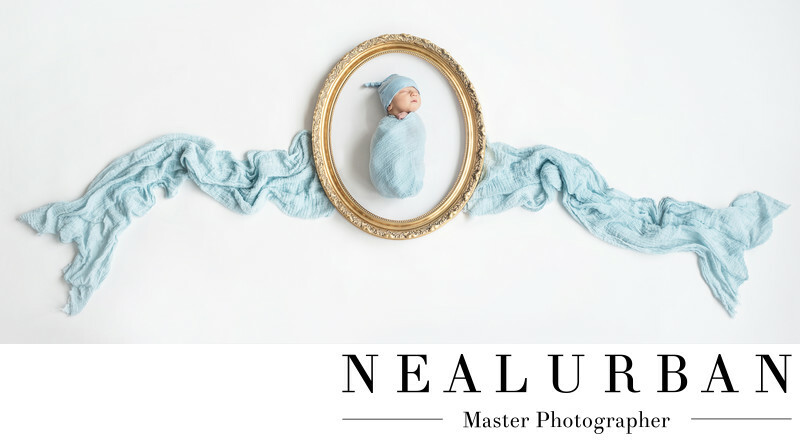 Now it was onto the newborn session at Neal Urban Studio. They wanted to keep it very simple. We decided to tie in small elements from the wedding. They did a lot of gold and sparkles. It was a very classy style wedding. We designed their wedding album this way too. They had an ivory leather with gold lettering for the names and wedding date. We had this gold frame we wanted to use for the newborn session. Then we needed to make it a little more fun by adding in the blue scarves and wraps. The white back drop really made the simple portrait look so neat and clean. We put the back drop down on the floor and shot this image overhead. I love how we were able to keep the high end classy feel for all of the sessions we have done with Nina and Greg so far. We can't wait for the little guys first birthday cake smash in a year! Location: Neal Urban Studio Buffalo NY.